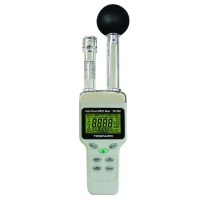 Categories: Digital Thermometer, Digital Thermometer, Hand-held Tester, Humidity Meter, Others, Temperature / Humidity Meter, Tenmars. 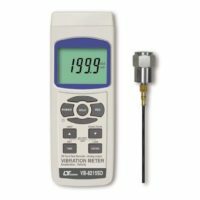 – Quick-response capacitance sensor, accurate measurement for wet bulb globe temperature(WBGT), black globe temperature(TG), humidity(%RH), air temperature(TA), wet bulb(WET) and dew point(DEW). – Max/Min and data hold. – LCD display with LED backlight. – Switch the temperature unit to ℃ or ℉. – Brass black ball in 50mm diameter. – Auto power off with disable function. – Data logging capacity: 12000 records, USB PC serial interface (TM-188D). – Sampling interval: Max 24 hours; Min 1 Second (TM-188D). 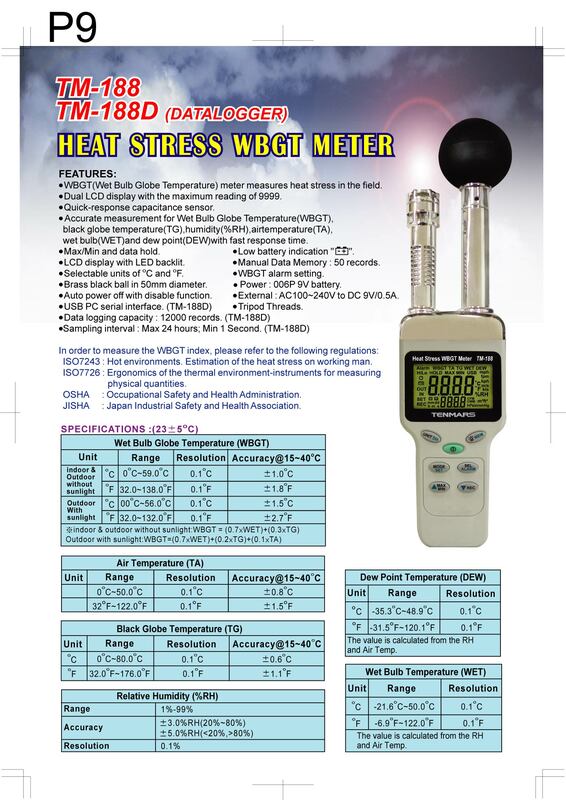 The HEAT STRESS WBGT METER is quick-response with accurate measurement for the effects of temperature, humidity, and direct or radiant sunlight. This instrument is ideal for the athletic trainers, military, occupational (Industrial) hygienists, outdoor worker and the sports medicine specialists; and it’s designed according to the regulations mentioned below. ISO7243 : Hot environments. Estimation of the heat stress on working man. ISO7726 : Ergonomics of the thermal environment-instruments for measuring physical quantities. OSHA : Occupational Safety and Health Administration. JISHA : Japan Industrial Safety and Health Association.